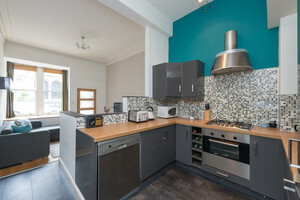 A stylish, contemporary Southside city pad in Edinburgh. 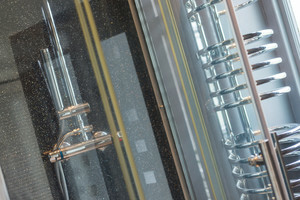 Ideally located close to the city's main shops and attractions. 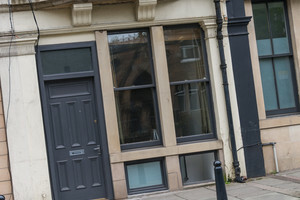 This quirky self-catering apartment in Edinburgh was originally a shop. 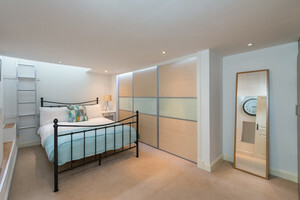 The owners have lovingly converted the property into a 2-bedroom city pad with a stylish interior. 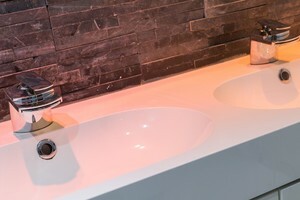 It has a contemporary and edgy feel, which reflects its unusual background. 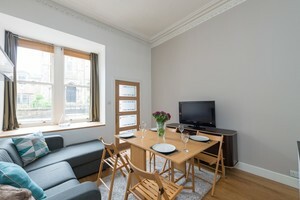 It would make a great space to stay during a visit to the Edinburgh Festival. 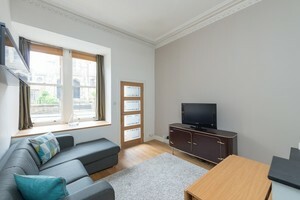 Located on the Southside of the city, near Fountainbridge, Lothian Road and The Meadows. 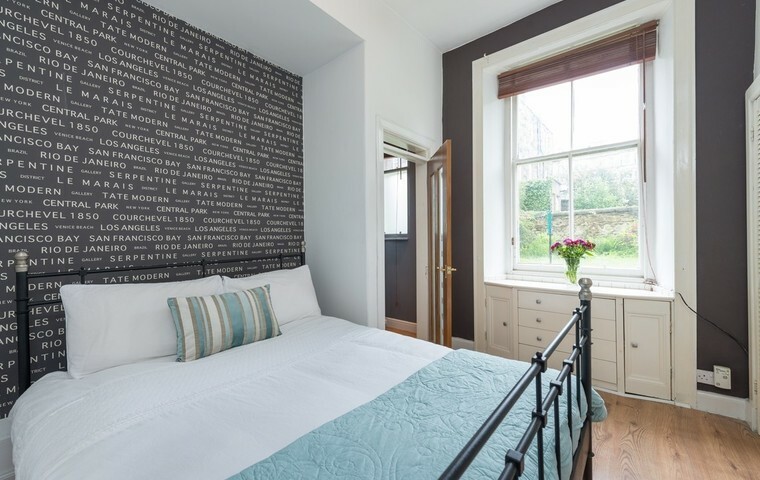 It’s a 15-minute walk to the vibrant Grassmarket area, or around 20 minutes to the historic Royal Mile. 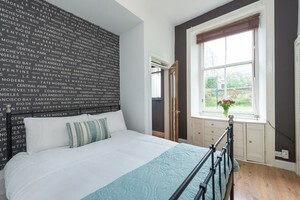 This self-catering apartment in Edinburgh has 1 king room and 1 double room. There is also a sofa bed in the lounge. So, it would be perfect for families and groups of 4 to 6 people. 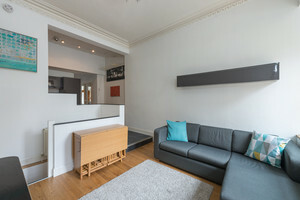 A modern, quirky apartment on Gilmore Place, Edinburgh’s Southside. 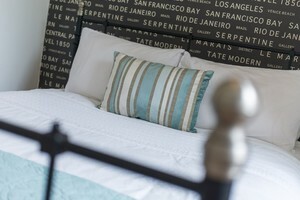 The lounge has a smart and contemporary sofa bed, with large flat screen TV and a lovely bright window space. A good spot to chill out and plan your days out. A modern and fully-equipped kitchen overlooks the lounge, which makes it a great entertaining space. And the addition of a folding table and chairs means that guests can dine together in the apartment. 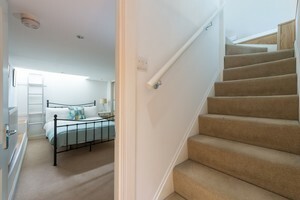 To the rear of the property, there is a master bedroom with kingsize bed and ensuite shower room. There is also a separate toilet on this floor. 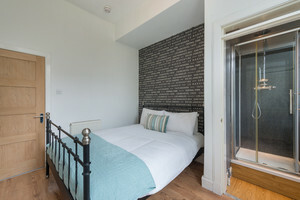 Downstairs, there is a spacious double bedroom, and opposite, a luxurious bathroom with his-and-hers sinks (with shower only). You can easily reach the area by rail from other parts of the UK. Take a train to Edinburgh Waverley or Haymarket Station and it’s just a short taxi or bus ride from there. There is a very good local bus service in Edinburgh, with regular buses to the area. Parking notes As this is a city centre property, roadside car parking is restricted. There is meter parking available, for a maximum stay of 4 hours. There is a car park close by at Fountain Park where guests may pay to leave their car for longer. 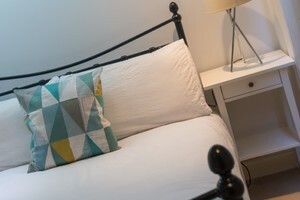 Local area The self-catering apartment in Edinburgh is situated on Gilmore Place, a residential area close to Fountainbridge, Lothian Road and the Meadows. It’s around a 20 minute walk into the centre of town where you’ll find historic attractions and busy shopping areas. Lorna's place was very nice and accommodating. We spent 3 nights there and it was just perfect for the stay in Edinburgh. 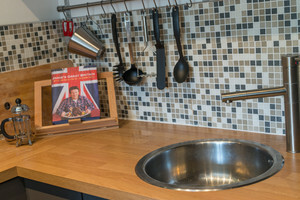 Very close to bus stops into the centre and only a 10min walk away from any pub/restaurant. Gilmore place is in a very good location with many transport possibilities, restaurants and only a few minutes walk from the city centre. The apartment is well kept and gives off a very homily feel. It has eveything a person requires for a stay In Edinburgh.
" The apartment is nice, and well located, 15 minutes from the center , that makes it a very quiet area that is great for rest. 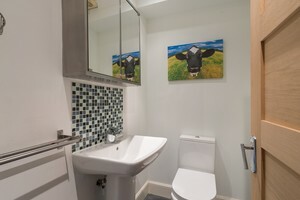 The house has the advantage that there are two bathrooms , and when we are several people is perfect. The only pity is that behind the floor there is a small garden which is not accessible , a sunny afternoon with a good beer garden that would be ideal. " The listing is a shop lot converted into an apartment. 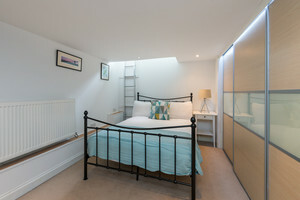 The location is quite central, about a 20-30 minute walk to major attractions in the city. Otherwise, the bus stop is right in front of the apartment! 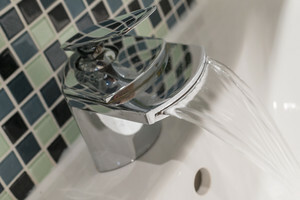 Sainsbury's and Fountain Park shopping centre is a 5 minute walk away. You don't get much privacy with the traffic on the road and people walking by the street, but it wasn't a problem for us as we are out most of the day. 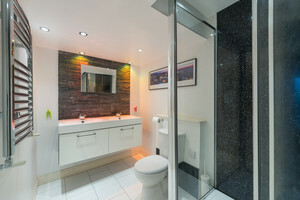 The interior is sleek, modern and clean, and having two bathrooms is a plus! Shampoo and body wash isn't provided though. 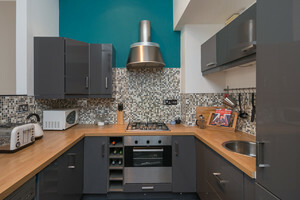 Other than that, all amenities are provided (there's a washer although this wasn't described in the listing) and the kitchen is well-equipped (free tea, coffee and milk provided). We did not get to meet Lorna, but she was prompt with replies and arranged for Magda (the housekeeper) to hand us the keys and give us a quick tour of the apartment. Overall, we enjoyed our stay! Looking forward to this year's Edinburgh International Film Festival? It's here from 20th June to 1st July 2018.